Russian proxies almost doubled the number of ceasefire violations in ATO zone. Most attacks took place in Donetsk and Mariupol sectors. 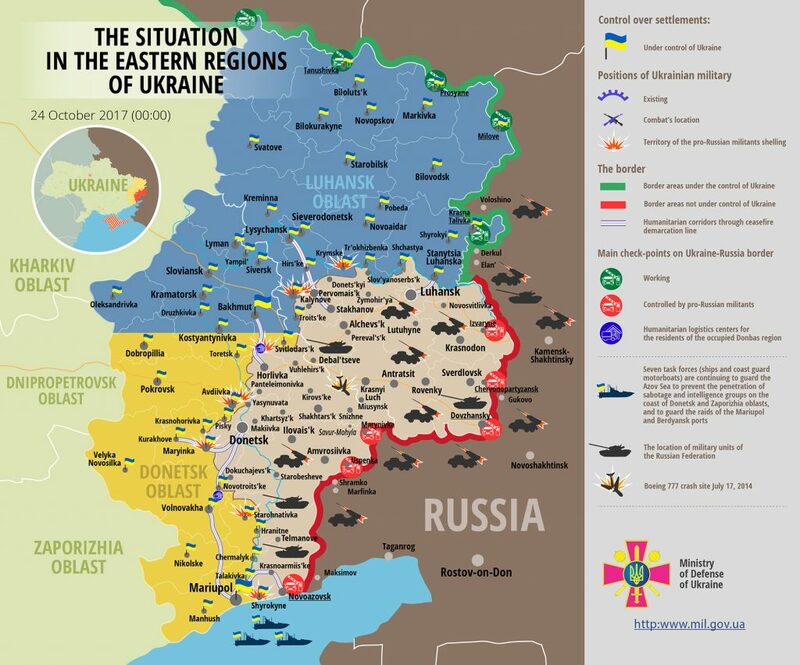 “In total, the enemy committed 22 attacks on Ukrainian Armed Forces’ positions. Ukrainian troops returned fire using weapons not proscribed under the Minsk agreements in 15 incidents where the hostile actions posed a threat to our troops’ lives,” reported Ukrainian Ministry of Defense spokesman on ATO Colonel Andriy Lysenko at a press briefing at Ukraine Crisis Media Center. In Donetsk sector, militants violated the ceasefire 10 times using small arms and light weapons near Zaitseve, Maiorsk, Avdiivka, Luhanske, Verkhniotoretske, and Shakhta Butovka position. Ukrainian troops responded to most attacks with small arms fire. In Mariupol sector, militants violated the ceasefire eight times. The situation was the most restless near Shyrokyne. “Russian proxies attacked Ukrainian troops with small arms and light weapons four times, and used 82-mm mortars twice against our positions near Shyrokyne firing eight rounds,” said the spokesman. All the other attacks took place near Vodiane, Starohnativka, and Maryinka which suffered two light weapons attacks. In Luhansk sector, Russia-backed militants conducted four attacks using small arms and light weapons near Krymske, Novozvanivka, Popasna, and Novooleksandrivka. Ukrainian troops returned fire. According to Chief Intelligence Directorate of Ukrainian Ministry of Defense, 13 militants were killed and 18 wounded during October 14-21. “The enemy sustained the largest losses – 13 militants from the 9th separate assault mechanized regiment – in Avdiivka sector,” said Col. Lysenko. Moreover, the so-called “DPR” is reported to have started recruiting volunteers to so-called “Azov Sea Cossack Army” in the temporarily occupied areas of Donetsk region. Ukrainian Armed Forces incurred no fatalities yesterday, but one Ukrainian serviceman was wounded in militants’ shelling near Maryinka. Report on the military developments as of October 23 is available here. Interactive data on the shelling: chronology shelling chart and the interactive map.